"The United States has evidence of consistent and wide-ranging Russian violations," the Trump official told the U.N. Security Council. WASHINGTON — The Trump administration on Monday accused Russia of cheating on sanctions on North Korea by "actively working to undermine" enforcement by the United Nations. "Russia has engaged in a concerted campaign in the Security Council to cover up violations of sanctions, whether they're committed by Russians or citizens of other states," U.S. Ambassador the United Nations Nikki Haley said in an address to the U.N. Security Council. "The United States has evidence of consistent and wide-ranging Russian violations." 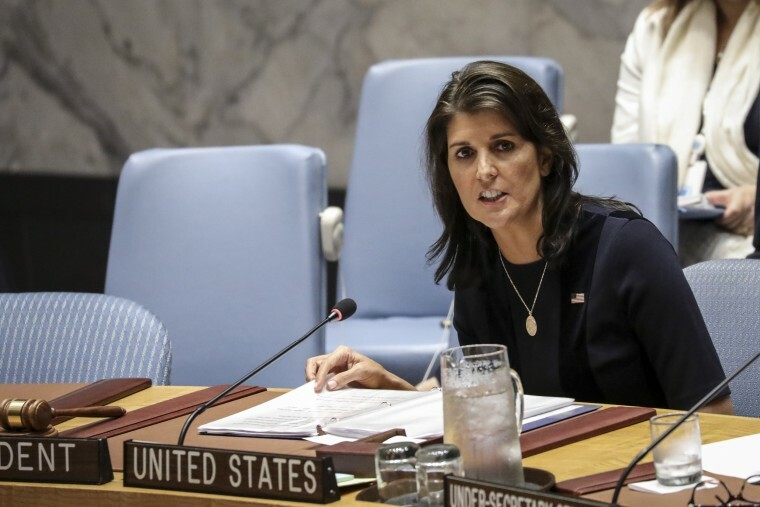 Monday's urgent meeting of the Security Council followed accusations by Haley that Russia pressured U.N. experts to alter an independent report implicating Russian actors in violations of North Korea sanctions. After discovering that a section of the report on violations by Russia and other countries had been altered, the U.S. prevented the report from being made public. "Our viewpoint was not taken into account, unsurprisingly, therefore we insisted on having our position reflected in the document," Russian Ambassador to the U.N. Vassily Nebenzia told the Security Council on Monday. Haley responded, "Deny, distract and lie — we have heard this same song many times before." In 2018, the U.S. tracked at least 148 instances of illegal ship-to-ship transfers to smuggle refined petroleum products into North Korea. The U.S. estimates North Korea has imported 160 percent of the U.N.-set cap of 500,000 barrels in the first eight months alone but suggest North Korea may have actually obtained four times the limit. This is just the latest in a series of sanction violations alleged by the Trump administration since the Singapore summit between President Donald Trump and North Korean leader Kim Jong Un in June. The same August U.N. report, withheld from publication by the U.S. citing Russian interference, reveals Pyongyang has not stopped its nuclear and missile programs and is still violating sanctions by transferring coal at sea. The U.N.'s undersecretary-general for political affairs, Rosemary DiCarlo, informed members at Monday's U.N. Security Council meeting of even further evidence of North Korea continuing its nuclear program. The U.N. monitoring group, the International Atomic Energy Agency, reported in August that it had "seen signatures consistent with the continued operation of the plutonium production reactor, radiochemical laboratory and alleged uranium enrichment facility" at North Korea's Yongbyon nuclear site. As NBC News reported, the latest intelligence shows Kim's regime has escalated efforts to conceal its nuclear activity in the months since the Singapore summit, according to three senior U.S. officials. And despite the U.S. pushing international partners to maintain pressure on North Korea to denuclearize, full support from critical allies, Russia and China, has waned. Not directly accused of cheating by the U.S. in Monday’s meeting, China insisted it has always been a "positive, constructive force" in the push for the denuclearization of the Korean peninsula. "China would never allow Chinese citizens or enterprises to engage in any activities that violate council resolutions," the Chinese ambassador to the United Nations, Liu Jieyi, told the Security Council. "China's serious attitude toward implementation of the council resolutions on the DPRK and the cost it pays are obvious to all." Trump and Kim have recently exchanged letters but high level dialogue between the United States and North Korea has slowed and the most recent trip by Secretary of State Mike Pompeo to Pyongyang was canceled. Pressure on the United States to show progress in the talks is increasing as world leaders prepare to arrive in New York next week for the annual U.N. General Assembly. Trump and South Korean President Moon Jae-in are expected to meet at the U.N. following Moon’s own meeting with Kim on Tuesday. "The difficult, sensitive talks with North Korea are ongoing. The Trump-Kim summit has set us on the path toward complete denuclearization. But we are not there yet," Haley told Security Council members. "And until we get there, we must not ease the powerful worldwide sanctions that are in place."